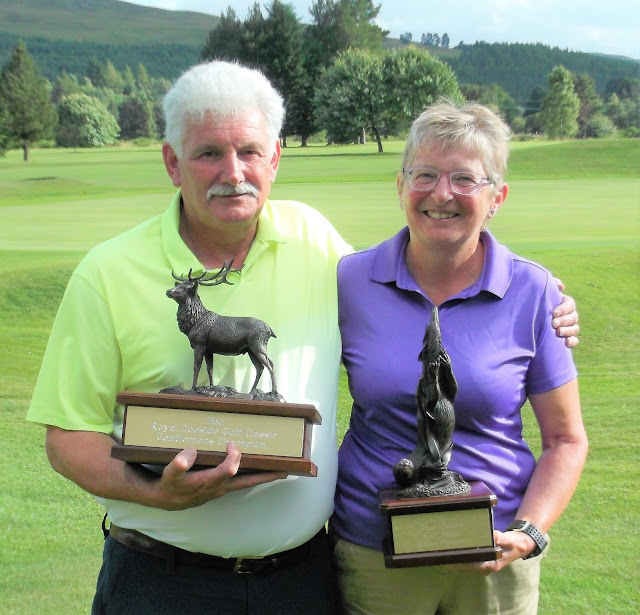 James Luff from Rushmore Golf Club, Salisbury and Turnhouse's Morag Wardrop won the men's and women's sections of the four-round Royal Deeside Classic, decided on a Stableford points format at Banchory, Aboyne, Braemar and Ballater. It is the fourth year in a row that Morag has won. This year she totalled 141pt, three ahead of joint runners-up Claire McPherson and Kathy McKay (St Regulus). James had a four-round points total of 149, winning by four from Neil Paterson (Royal Aberdeen) with Alan Thomson (Uphall) third on the 143 mark. MEN - Ricky Will (Peterculter), David Foster (Lundin) 37pt; Graham Lambie (Chase) 36pt. Nearest pin prize: Alan Thomson (Uphall). WOMEN - Morag Wardrop (Turnhouse) 39pt; Marion Currie (The Glen), Sally Jones (Rushmore) 37pt. Nearest pin prize: Angela Flynn (Wimbledon Park).